The 6 photos above were taken by Kirstie who owns 2 full but younger brothers of Windy & Barni's. Windy did a full season picking up on 2 new shoots during the past Shooting Season & is very much now getting to be as good as his Grandmothe Hazel ever was ! 2016 started after a busy season out on the shoot & Windy being a big part of my picking up team. 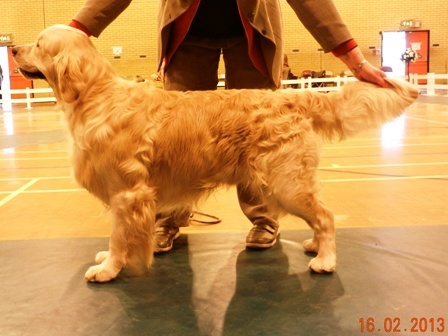 We then started taking Shade our youngest member of the Purbarn Pack to some shows and Windy went along as a companion and at Stoke-on-Trent Gundog show Windy took BOB and Shade took RBOB + BP, so we kept it in the family ! Windy has enjoyed entertaining some lovely ladies & we look forward to seeing more of the offspring in the Show Ring during the latter part of 2015 & into 2016 too. After the shooting season is over if there is nothing else to pick up all the dogs seem to like to collect sticks for the log burner and Windy is no exception, although he also likes eating bit of the sticks he collects. Windy just waiting for the birds to start falling on a shoot day during the 2014/2015 shooting season. 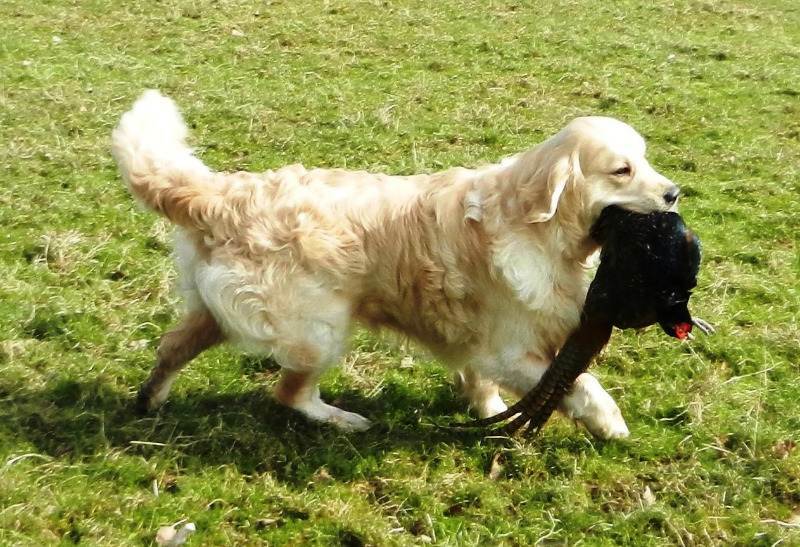 We took Windy to Shropshire Gundog on 25th May 2014 & were very pleased with him as he took BOB. Photo below. 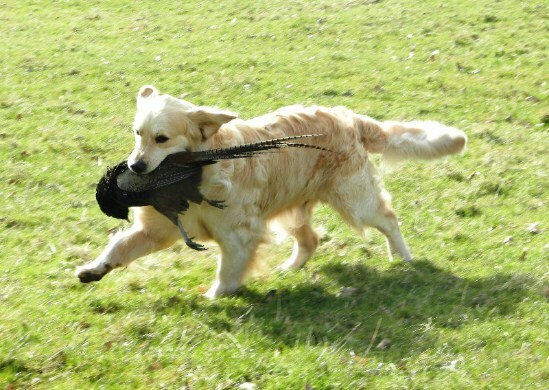 Windy has now turned 3 years & has turned into a lovely character & both a good show dog & Stud dog & now has proved his worth in the shooting field as one of my regular Picking-up team too. 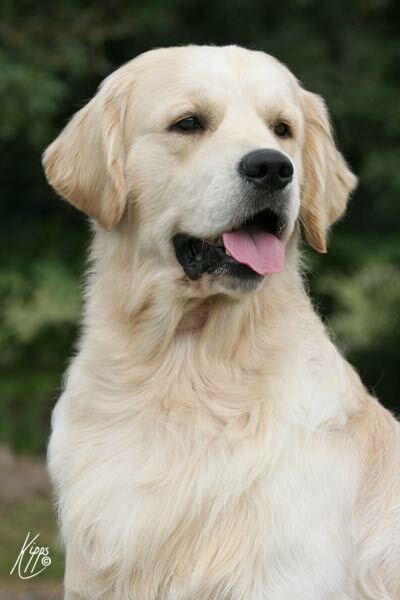 This was a long retrieve from just down by the edge to the wood. 12th to 14th July 2013 At the GRC Centenary Celebrations Windy managed a 6th in the Graduate Class on the first day & was in the last 8 on the second show day. This was his first trip away from home over night and he stayed with me in our nieces house in Cirencester just 5 minuets down the road, so very handy & he behaved himself throughout the 4 days. 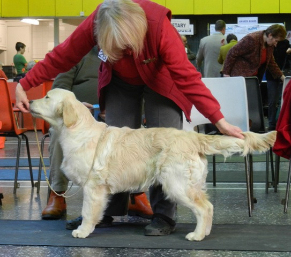 Above Windy showing at National Gundog Championship Show 2012 just after he had taken his Junior Warrent. Head shot taken the same day. 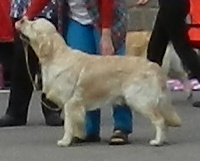 & at just under 2 years old at Golden Retriever Club of Wales Championship Show, now he has his full coat, although the lighting in the hall makes his coat look a slightly different colour to what it is naturally. 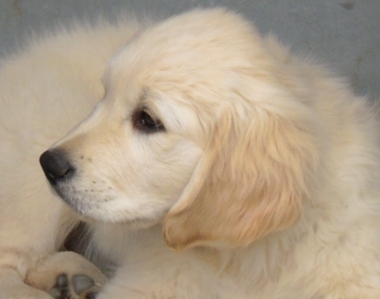 Windy is from the 14th generation down of the Purbarn line & we are very pleased with him. He compleated his Junior Warrant at just 13 months & during the 2012/2013 shooting season showed us he will be a valued member of the Picking-up Team with a little more practice. Windy at 6 weeks. 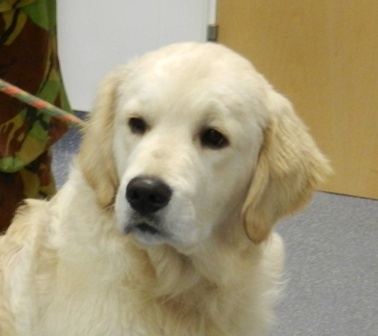 Head shot at 11 weeks & Windy at his first show taking 1st and Best Puppy in Breed.